Over the past month or so, I’ve been working on testing new ways of introducing myself and my coaching to new audiences. I’ve been working on Facebook ads and lead magnets to see what works and what doesn’t. One of the biggest takeaways from that process of trying new approaches was the understanding that it doesn’t always work the first time you try something new. 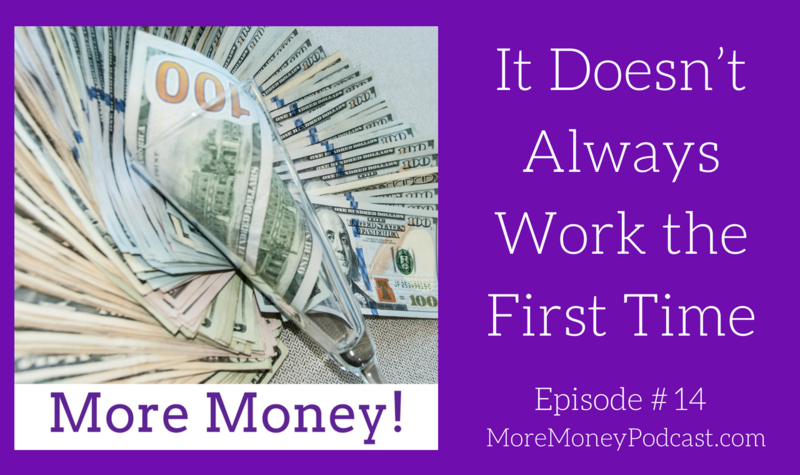 On this episode of More Money, I share my thoughts and advice about trying new things in your business and how long you should stick with them before trying something else. I also explain the importance of getting clear on your final destination and staying the course in any of your business endeavors despite failed attempts. The importance of getting clarity about what you want. Why often new things don’t work out on the first try. The power of 90-day commitments. The importance of course correcting. How to minimize the amount course correcting needed to get to your destination.